Separate determinations of household size are made for each member of a family, and the categories are based on expected filing status. MAGI rules apply to children, pregnant women, parents and caretaker relatives, and adults in states that have expanded Medicaid eligibility. Seniors and people eligible for Medicaid based on a disability use different household and income rules. 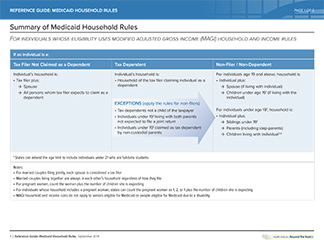 This reference guide walks through the Medicaid household rules for MAGI Medicaid eligibility.